Home coupon , coupons , Groupon , saving money Introducing Groupon Coupons! Coupons aren't just for scrimping and saving anymore. They're about the thrill you get when you outfox a hefty price tag with gumption and a dash of know-how. So Groupon has partnered with over 8,500 national retailers to launch a wonderful new service they call Groupon Coupons. Unlike their regular Groupon offers, you don’t need to register or purchase anything upfront. 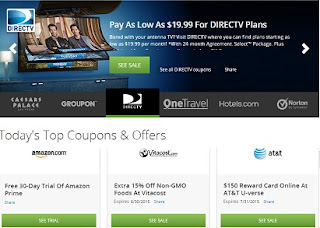 Groupon's expert deal explorers spend each day mapping out the internet's coupon wilderness to help you discover huge savings every single time you visit your favourite online sites. Here’s a round-up of just some of our favorite deals—happening right now! Kohl's: enjoy up to 50% off on toys. Starting saving today with Groupon Coupons!